The wild turkey thrives as a classic example of wildlife management success. During the Depression years, wild turkeys numbered fewer than 10,000 in Alabama and were restricted to scattered pockets of isolated habitat. In the short time since then, restocking of suitable habitat, protection, and management have allowed turkeys to respond dramatically to favorable land-use changes. Wild turkeys now occupy portions of all 67 counties in Alabama and may exceed 300,000 in number. During fall and throughout most of winter, wild turkeys gather in flocks. Flocks are usually distinct units comprised of adult and young hens, adult gobblers, or, by mid-winter, young gobblers. Large flocks, often referred to as droves, are more common in western races of the wild turkey than in the eastern subspecies found in Alabama. Stimulated by warming temperatures and increasing daylight, flocks begin to break up during late winter and early spring. Young gobbler groups, however, may remain together throughout their first spring. In preparation for nesting and rearing their young, hens typically disperse to areas containing openings or fields. Adult gobblers establish loose, poorly defined ranges near such areas and call or gobble to attract hens for mating. Breeding is promiscuous. Gobblers may mate with several hens and hens may mate with more than one gobbler. Some young gobblers reach sexual maturity during their first spring, but very few mate until the following year. Although some egg laying occurs during March, most hens begin nesting during April. A clutch of about 10 eggs is laid in a shallow, leaf-lined depression on the ground. Twenty-eight days of incubation are required for the eggs to hatch. Hens assume all incubation and brood-rearing responsibilities. On the average, fewer than 50 percent of all nests are successful. If initial nests are destroyed or abandoned, hens often attempt to nest again. The young, known as poults, are covered with natal down at hatching. Although immediately able to run about and feed themselves, they require brooding by the hen to keep warm. Poults feed heavily on insects and other high protein matter during their first few weeks of life. Poult mortality averages nearly 70 percent with the majority of that loss occurring by two weeks of age. The growth of poults is rapid. By three to four months of age, the young are almost indistinguishable from adults. By this time, young gobblers usually outweigh and stand taller than adult hens. By fall, hens and their broods join other such groups—as well as unsuccessful hens—to form new flocks. Annual home ranges of wild turkeys often exceed 1,000 acres. Range size in Alabama is related to the amount, availability, and condition of critical habitat components. Turkeys in poor habitat may range over several thousand acres annually. Extensive tracts of land are needed to retain large populations of turkeys year-round, but turkeys can be attracted to small holdings for the hunting season. Ideal habitat is difficult to define. Given good protection, turkeys can adapt to several habitat types and conditions. A good range consists of predominantly mature, mixed pine-hardwood stands, interspersed with field and grassy openings. Habitat for turkeys must offer sufficient sources of seeds, nuts, and other energy-rich food sources during fall and winter. Mast of hardwoods, particularly oaks, is used extensively during this time. 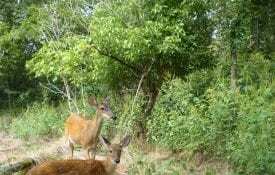 Dietary preferences shift to leafy vegetation, animal matter, grass seeds, and soft fruits during spring and summer. Much of these needs are satisfied by feeding in fields, forest openings, and around the edges of such habitat types. Hens prefer to nest in brushy areas that offer good cover. Nesting covers and protective covers for adult turkeys are usually plentiful in Alabama. However, protective cover for poults can be critically limited. The survival of turkey broods is influenced by the quality of habitat used. Broods less than two weeks old need access to areas that give good overhead cover and protection from predators. Broods in good habitat experience fewer losses than those in poor habitat. Excellent habitat for young poults would be fallow fields and woodlands with an open canopy that allows plants to grow at ground level. Turkeys require water almost daily, but they satisfy much of that need by eating succulent vegetation and fruits. Access to water does not limit turkey distribution or abundance in Alabama. To increase the number of turkeys on a tract of land, you must first evaluate the present abundance and quality of habitat types on the property. Because turkeys are mobile, also consider the land types and usages of adjacent properties. For example, if adjoining lands are dominated by unbroken stands of mature hardwoods, few turkeys could be attracted by managing your land similarly. 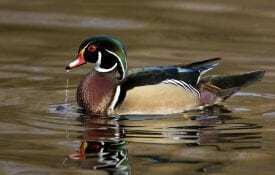 Instead, you would benefit most by providing openings and other habitat types. No precise rules govern the minimum amount or proportions of particular habitat types that must be available to turkeys. For example, turkeys may thrive on some areas with a low hardwood component if other areas, such as pine stands or food plots, are managed to meet or supplement fall and winter food needs. The following are general guidelines to consider when managing land for turkeys. HARDWOOD MANAGEMENT. Retain a variety of mature, mast-producing hardwoods. Stands of such types should be well distributed over the area. Cutting rotations for hardwoods should extend at least 70 years on most sites. If thinning, select against hickories, sweetgums, and poplars, while retaining beeches and oak groups. If mature hardwoods cover less than 25 percent of an area, do not cut hardwood stands unless equal or greater portions than that scheduled for cutting are entering mast-producing stages. PINE MANAGEMENT. Short rotation pulpwood management over extensive areas leaves little prospect for wild turkeys. However, high densities of turkeys may exist on large tracts managed primarily for pine saw timber. Restrict pine management to sites best suited to pine production. Leave hardwood-dominated drains and stream bottoms uncut when harvesting or establishing pine stands. Pine woodlands may be burned during the dormant (winter) or growing (spring/summer) seasons, depending on the management objectives of the pine stand. If it is necessary to burn during the growing season, which coincides with the turkey nesting season, care should be taken to ensure that other nonburned areas are available for nesting habitat. Although some nests may be destroyed when burning pine stands during the growing season, the long-term habitat benefits (brood rearing habitat, future nesting habitat, etc.) of occasional growing season burns will likely outweigh the immediate loss of a few nests. Furthermore, if a nest loss occurs early in the nesting season, turkeys will likely renest. The Alabama Forestry Commission provides technical assistance on fire use and can help with the construction of fire containment lanes. MANAGING OPENINGS. High densities of turkeys rarely occur where fields or forest openings are absent or scarce. Turkeys may thrive where openings comprise as little as 5 percent of the total area and as much as 50 percent. To retain turkeys throughout the year on heavily forested land or to attract them during spring, provide openings of 5 to 20 acres. Long, narrow openings are provided by utility right-of-ways or by widening logging roads. Improved pastures provide excellent feeding areas for hens and older poults. Mow ungrazed or lightly grazed openings during mid-summer to stimulate new growth and to prevent such areas from becoming too thick or rank for turkey use. Field edges should provide a subtle transition from woodland to opening, allowing poults to have access to cover when feeding in fields (Figure 4). This can be done by thinning trees along field edges or allowing edges to revert to brushy cover. If fields or pastures are heavily grazed, build fences several yards out from the woodlands to prevent cows from cleanly grazing field edges. SUPPLEMENTAL PLANTING. Plant food plots to supplement native foods and to attract or retain turkeys during specific seasons of the year. Plots should be well distributed and located in or near woodlands. Where turkeys and deer are abundant, plots of at least 1 acre are needed. Corn, chufa, soybeans, and grain sorghums are planted extensively to supplement fall and winter foods of turkeys. Vetch, rye, wheat, clover, and oats provide winter grazing for turkeys. Seeds of browntop millet and other grain crops are used heavily during summer (Table 1). Refer to Extension publication ANR-0485, “Wildlife Plantings and Practices,” or ask your county agent for information regarding suitable varieties, planting dates, and planting methods. PROTECTION. Turkeys can adapt to widely varying conditions. 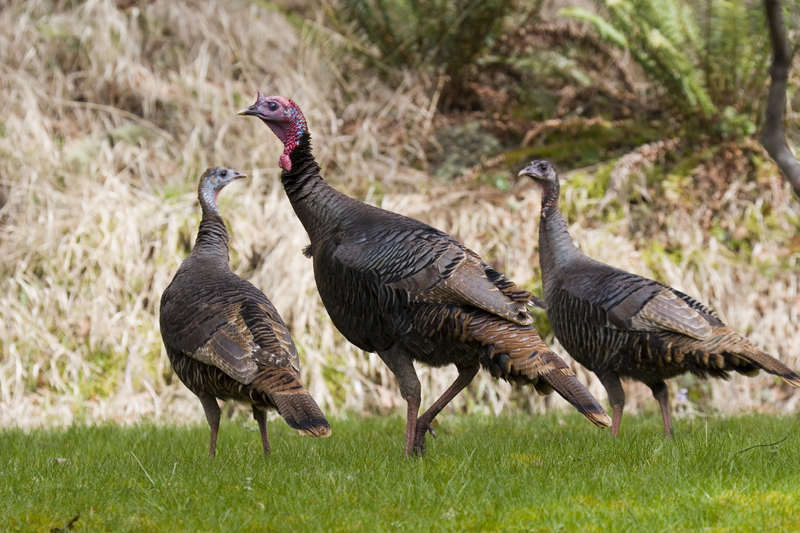 Given adequate protection, large turkey populations may exist in marginal habitat. Poaching, however, may limit population growth in very good habitat. Restrict access to lands managed for turkeys and erect gates at the entrances of all access roads to discourage unnecessary traffic. Minimize disturbances to hens during nesting and brood rearing. Pen or remove free-ranging dogs. Where possible, delay cutting timber and mowing fields until July once nesting begins. If fallow fields are scheduled for cultivation, plow them before nesting activity begins.